Historically, two complementary design flows and methodologies have been used for mixed-signal design. For an analog-centric design that integrates small to medium amounts of digital logic, a schematic-driven flow with an Analog-on-Top (AoT) methodology is used. For a digital-centric design where the analog/mixed-signal (AMS) IP is imported, a netlist-driven flow with a Digital-on-Top (DoT) methodology is used. Cadence® Mixed-Signal Solutions improve and optimize these flows and methodologies in ways that improve communication, reduce iterations, and streamline the engineering change order (ECO) process. The introduction of OpenAccess as a single design database, and new capabilities such as mixed-signal routing, have led to greater productivity and faster turnaround time. However, for designs that very tightly integrate analog and digital functionality, Cadence has introduced an advanced methodology: Mixed-Signal-on-Top (MSoT). 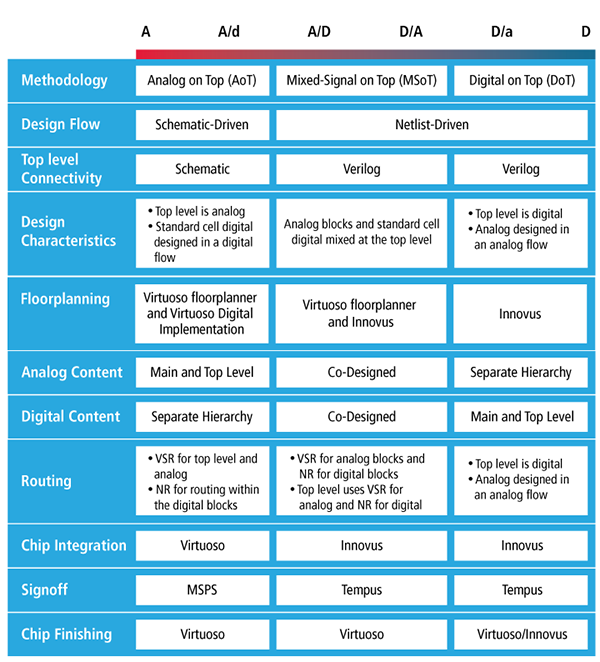 This is a co-design methodology in which chip planning, design, implementation, physical verification, and signoff are shared responsibilities between the analog and digital teams. The MSoT methodology enables and promotes concurrent design, facilitates greater collaboration, and supports the mixing of analog and digital blocks at the top level of the design, which improves overall productivity and increases design throughput. 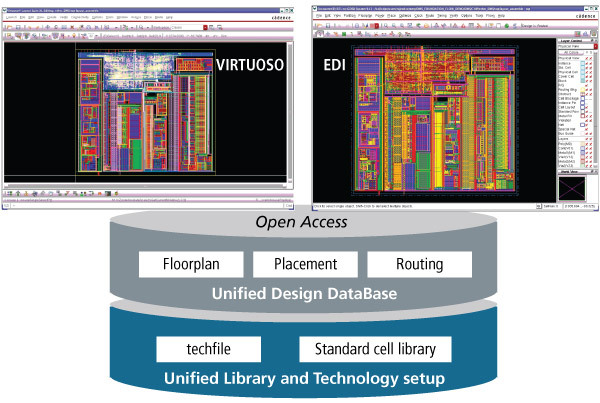 By interfacing the Virtuoso® and Innovus™ platforms through the industry-standard OpenAccess database, Cadence has enabled a new generation of interoperable mixed-signal flows and methodologies that help analog and digital design teams efficiently implement complex mixed-signal designs. This has resulted in less iterations and communication errors between design teams, especially during floorplanning, chip integration, and ECOs.